Super Tuesday came to Carroll in a different way this past week. 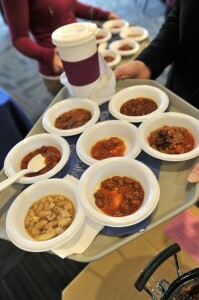 Faculty, staff, and administrators enjoyed more than 15 different varieties of chili at the third annual Carroll Fund Chili Cook-off on Tuesday, February 14. The event highlighted the FSA Give Back to Carroll campaign, and allowed employees to not only cast their vote for their favorite chili, but also for John Carroll through a gift to the Carroll Fund. If you were unable to attend the Chili Cook-off and would like to donate to the Carroll Fund, contact Megan Juby ’89, interim director of annual giving, at mjuby@jcu.edu or 216.397.4989.